“A is for Apocalypse” released! It’s with great pleasure that I announce that “A is for Apocalypse,” featuring my story for the letter “Z,” is now available on Amazon, Smashwords, and Createspace in softcover and a variety of digital formats. Read on for the blurbs or skip to the bottom for the links. What do you get when you take twenty six amazing writers, randomly assign them a letter of the alphabet and give them complete artistic freedom within a theme? Twenty six apocalyptic stories written by both well-known and up-and-coming writers. Monsters, meteors, floods, war—the causes of the apocalypses in these tales are as varied as the stories themselves. “Editor Rhonda Parrish gives us apocalyptic fiction at its finest. There’s not a whimper to be heard amongst these twenty-six End of the World stories. A wonderful collection.” –Deborah Walker, Nature Futures author. Find it on Goodreads here. Get it in Kindle format from Amazon here (Amazon paperback ordering coming soon). Get it in every other digital format from Smashwords here. Enter coupon code TY6D2CWD for 10% off (valid until the end of August). Get it in paperback format from Createspace here. Enter coupon code PJ67Q for 10% off (valid until the end of August). I’m very pleased to announce my participation in the anthology “B is for Broken” edited by Rhonda Parrish. As with “A is for Apocalypse,” all the contributors get a letter for a writing prompt, with the story somehow relating to the word “broken.” My letter in “Apocalypse” was Z, and for “Broken” it’s P. Looking forward to it! “A is for Apocalypse” Cover Reveal and Contest! 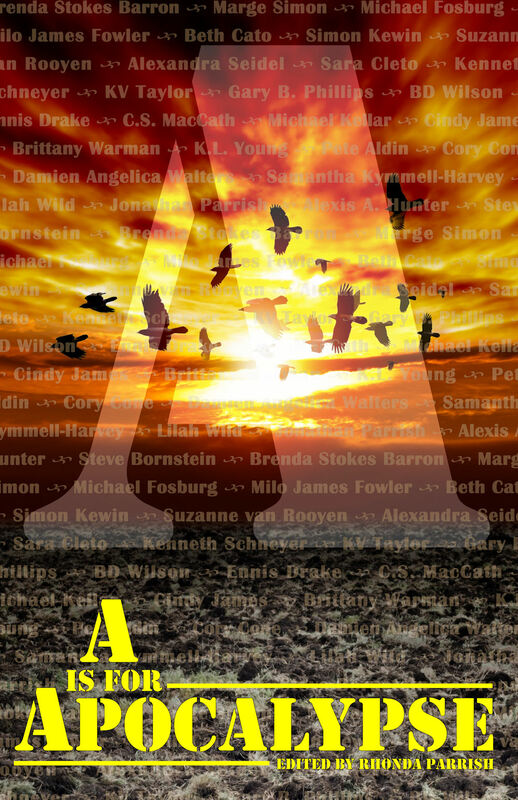 “A is for Apocalypse” contains twenty-six apocalyptic stories written by both well-known and up-and-coming writers. Monsters, meteors, floods, war–the causes of the apocalypses in these tales are as varied as the stories themselves. “Editor Rhonda Parrish gives us apocalyptic fiction at its finest. There’s not a whimper to be heard amongst these twenty-six End of the World stories. A wonderful collection.” -Deborah Walker, Nature Futures author. Rhonda is giving away three ARC copies of A is for Apocalypse (tour-wide). These are physical copies but she is willing to ship them to anywhere in the world. The Rafflecopter draw will run from May 12th to May 19th. On May 20th she will choose three winners and email them in order to get their shipping address. Anyone who doesn’t respond by May 27th will forfeit their prize and she will choose a new winner to receive it. I got to go to Dragoncon this year. After years of hearing about the costumes and the parties and the panels, my schedules finally aligned just right to allow me to go. Granted, I had to fly in from the rig at 6pm and turn right around to fly out to Atlanta at 9am the next morning, but remarkably everything went off without a hitch. Now, I’ve been to Gencon a couple of times. I’ve been afloat in a sea of 30,000 gamers, cosplayers, and other assorted geeks. I thought I was ready for the Dragoncon experience, but boy was I wrong. First off, the walking. Oh my god, the walking. Gencon takes place almost entirely in the Indiana Convention Center. It’s an enormous building, but it’s all in one spot. Panels are usually an hour or so in length, but game sessions typically run three to four hours long. It might take a few minutes to walk from one thing to another, and if you’re going to a game session you’ll be sitting for a while. Dragoncon, by contrast, is mostly nothing but panels that are spread about across four or five hotels in downtown Atlanta. Three of the hotels are connected by covered footbridges, but you still might have to walk blocks to get from one panel to another. That doesn’t take into account each hotel having multiple floors of events, either. If you go to Dragoncon, bring some good walking shoes because you’re going to be using them. Then there were the costumes. Gencon had its share of cosplayers, but Dragoncon is one of the premiere con destinations for cosplayers. You’d see a good number during the day but they really came out at night, parading around and gathering in the hotel common areas. Just about everything I saw was brilliant and I’ll be posting a gallery of the best of them shortly. Dragoncon is aimed much more at the general fandom crowds than Gencon, so the programming was a lot different. I got to see George Takei talk, attended several writing seminars (some of which were actually useful), attend a showing of the Dr. Horrible Picture Show (probably this generation’s equivalent of “Rocky Horror”), got to hear some famous authors dish out some excellent advice, go cosplaying myself, and generally wallow in the fandom for a holiday weekend. There were a few hiccups, of course. I wasn’t prepared for all that walking, some bits of my costume got left behind and I had to improvise, schedules were just too full and some cool things had to be missed in favor of other cool things. But all in all it was a fantastic time, and I’m hoping to get to go again next year. He stumbled through the shattered doors, tripping over blasted runed granite. Dragonblood drizzled off him, sizzling into the snow in fat purple drops. Somewhere in the keep behind him, Rhaedon, the mad dragon mage, slowly cooled.